Team effectiveness is crucial to organizational success. Organizations know from experience and research, the way people work together is important for success. Be it a supply chain team, a taskforce, a work team, sales team, virtual team, management team or leadership team. “Tacit knowledge” or knowing where and what your teammates are doing, having confidence in their individual competencies, and having confidence in the teams overall competencies, contributes significantly to the productivity and success of an organization. A one or two-day program customized to your organizational needs: Brainstorming, priorities alignment, business simulation games and team “organigrams” to better understand individual and combined strengths of a team. Measure how your teams are performing. Are they communicating effectively, delegating responsibly, competent in their roles? The NBOGroup “Team” 360º measures these team competencies. The “Team” 360º results allow you to develop the team and its members for optimal productivity. The benefit for you is a team that operates with role clarity, sound competencies and confidence in others. The team “Synergy” takes affect and you increase efficiency, effectiveness and results. Ideally for: Any team in the organization: executive teams, functional teams, sales teams, virtual and project teams. NBOGroup’s 360° Feedback System is based on a dual scale frequency gap analysis methodology. Find out what the benefits of a dual scale 360 are and how it enhances the effectiveness of a developmental 360 feedback survey. The NBOGroup has been conducting annual Leadership surveys for more than a decade. Year on year, we uncover the top common challenges faced by many organizations. 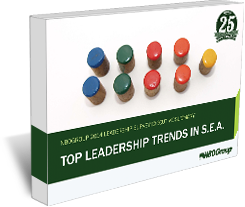 Find out this year’s trends with this free survey report!